Thread: Ever use the Quick Curve ruler? I'm just wondering if anyone here has ever used the "Quick Curver" ruler from Sew Kind of Wonderful? 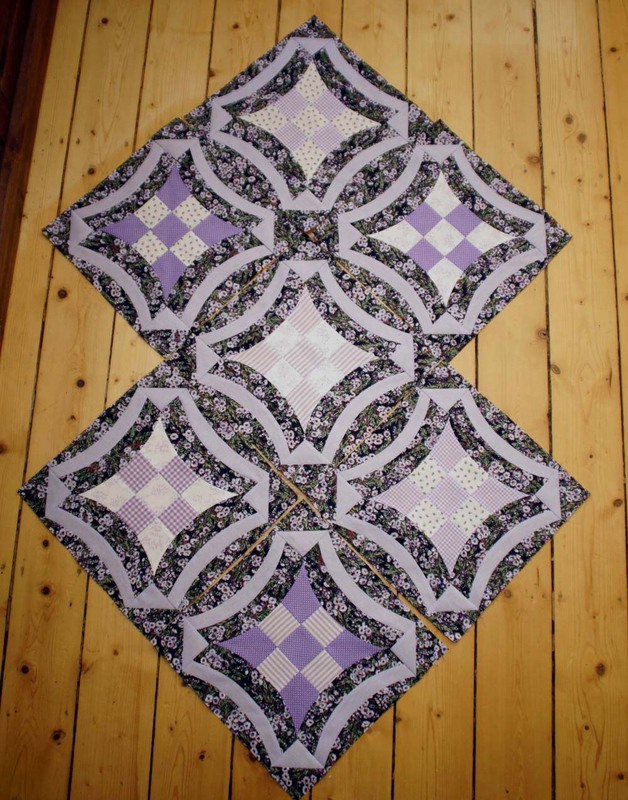 Anyway, I was just wondering if anyone has any tips on how to get blocks put together and have them lay flat after pressing? Mine aren't bad, but not as flat as when sewing/pressing straight seams. Also, I'd love to see more projects with this ruler if anyone has any to share. Well this is the first time I've ever seen this ruler so thanks for sharing with us...Secondly bad bad girl lol I'm a gadget girl and can see one of these in the future. Not sure why the they aren't laying flat, but maybe clipping in the curve area would help some.... Ok so I went back to the site to look at the patterns and noticed they are offering pdf files...that's great until I seen they are charging full price....WHAY really, I'm the one as a customer that will have the bigger expense of printing them off....I see this alot on other sites who are offering digital patterns...Wouldn't it be better to charge half the price for the pattern? Last edited by btiny36; 05-14-2013 at 07:31 AM. ​I have seen the ruler but didn't have any ideas on how to use it. The site shows some neat ideas. She offers tutorials on her blog. I've also found her responsive whenever I've left a comment. She is very approachable for help. I would go there if you are not satisfied with your results. I'll bet she can give you some good tips. Ah, the tutorials are helpful. I think I need to try always having my outside curve on top. I think I wasn't doing that yesterday. She pressed differently than I was too. I think more practice will certianly help too. yes, but you don't have to do the odd hand thing she does when sewing the curves together. I don't. I keep the background piece on the top as i sew. There is a photo on here called 1st Metro Ring(s) you can look for. I also posted one arc sewn to the yellow background pieces. I've done 14 now. whew! I have the Metro Rings pattern (wedding ring) and the Urban "something". can't think of that name at the moment. it takes reading and reading and careful placement of that ruler but it can be done. I have the ruler;used to make metro rings modern term for double wedding ring. In her pattern directions you do not need to clip curves. They press nicely after being sewn. but you do not press after every seam. It seems to work well, but I probably will not make another wedding ring quilt to soon. To much waste of fabric. I made the Urban Nine Patch as a shop sample for my LQS. It went together pretty easy. Peggi, that is gorgeous!!! I have been on the fence about purchasing this ruler, but the one pattern I love is the Urban Nine Patch! Well this is the first time I've ever seen this ruler so thanks for sharing with us...Secondly bad bad girl lol I'm a gadget girl and can see one of these in the future.they are offering pdf files...that's great until I seen they are charging full price....WHAT really?, I'm the one as a customer that will have the bigger expense of printing them off....I see this allot on other sites who are offering digital patterns...Wouldn't it be better to charge half the price for the pattern? Interesting, but don't beleive I want to try it. 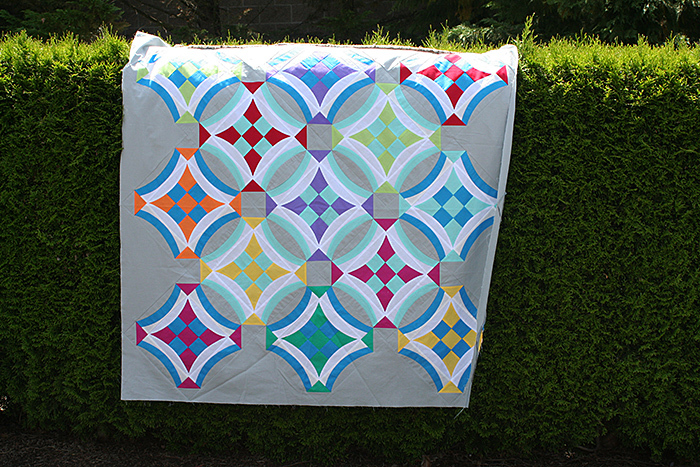 I just finished a metro latice quilt from Sew Kind of Wonderful, and I was thinking as I made it that it looked a lot like a double wedding ring. My biggest mistake was in not trimming/pressing every step. I love the result, however. 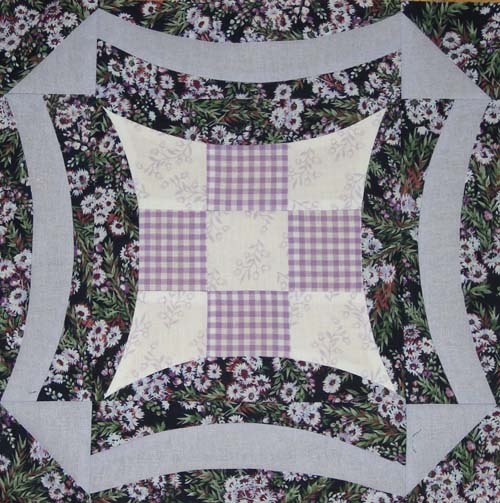 This is my second quilt with the quick curve ruler - and what I liked most about it was that it used all the bits which were cut off the center squares. Very little waste, overall.